The Monitors were fleeting sparks in the steelworks of Australian pop, and - so far as I can tell - didn't really manage to have any impact outside their home country. Formed as a studio ensemble in 1980 by session musicians Mark Moffatt and Terry McCarthy, they're most mentioned these days for their connections with the twin sister actresses Gayle and Gillian Blakeney who eventually joined the TV soap "Neighbours". The concept was quite simple, and quite cynical if we're being critical. Neither Moffatt or McCarthy were particularly photo or telegenic, and the workaround for this in the band's videos and TV appearances was to involve the young sisters in a variety of ways. While they didn't sing on any of the records, the very young Blakeneys donned Kiss makeup and leapt around a lot for the debut single "Singin' In The 80s", which reached Number 16 on the Australian charts. 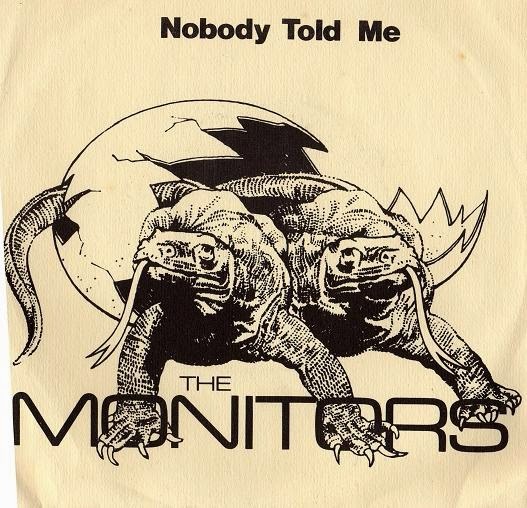 Such was their visual impact at the time that some people began to believe that The Monitors were the Blakeneys group, rather than them simply being employed as a visual element. 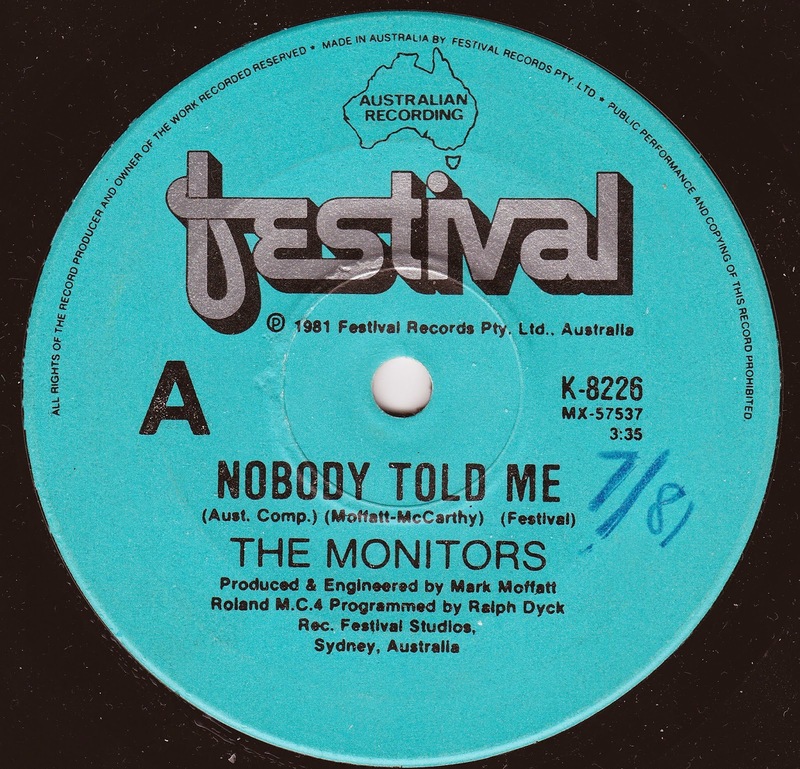 They featured in a rather more subtle way in the video for the follow-up single "Nobody Told Me", which was less successful, peaking at a modest number 32. Unfair, since if you ask me "Nobody Told Me" is a far superior single, sounding incredibly of its time with the pulsing and squeaking synths and melodramatic vocals, but having such a killer hook in the fanfare of a chorus that it's irresistible. The nagging female backing vocals (performed by Kim Durant and mimed by the Blakeneys) are also enormously effective, and it's glorious pop music - Moroder tinged, melancholic and horribly addictive. Hit-wise this was The Monitors last hurrah. Their album "Back From Their Recent Illness" failed to sell well, and Moffatt went on to work with numerous other bands (including The Saints and Mental As Anything) while McCarthy left the music industry to work in advertising. We all know what happened to the Blakeneys, on the other hand, who also turned up unexpectedly in the video for Pop Will Eat Itself's "RSVP" in 1993, again despite having nothing at all to do with the track. Mine is not to reason why, though as PWEI weren't very photo or telegenic either, you can't help but draw the same conclusions from that particular gatecrash. Meanwhile, with the big beards and synth obsessions, maybe The Monitors would have been more at home in East London in the 2010s rather than Australia in the 80s. Life is cruel. Afraid I haven't included the B-side "Wishful Thinking" here as its scratched to kingdom come. Suffice to say that it's a reflective Phil Collins styled mournful ballad sung over an electronic piano. You're missing nowt. Why didn't they go the whole hog and draft in a good-looking guy to front the videos too? Having said that, I fully agree - killer chorus, clever backing vocals, and worthy of a bigger hit. Wow - I was 16 when this song was released back in 1981 in Australia, and remember it well. I reckon Gillian and Gayle needed someone 'beefy' to help out in their music career, having managed two one-week UK hits peaking at 62 and 75. Mind you, if I saw someone like them wearing this tiny amount of Bacofoil on my tube to work, it would make my day..